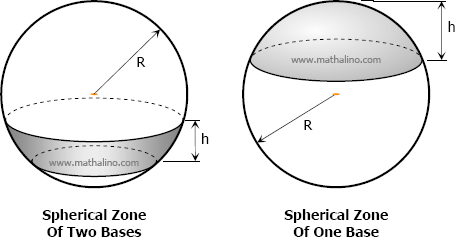 A zone is that portion of the surface of the sphere included between two parallel planes. The bases of the zone are the circumference of the sections made by the two parallel planes. The altitude of the zone is the perpendicular distance between these two parallel planes. If one of the bounding parallel planes is tangent to the sphere, the surface bounded is a zone of one base. The area of any zone (one base or two bases) is equal to the product of its altitude h and the circumference of the great circle of the sphere. Note that when h = 2R, the area of the zone will equal to the total surface area of the sphere which is 4πR2.